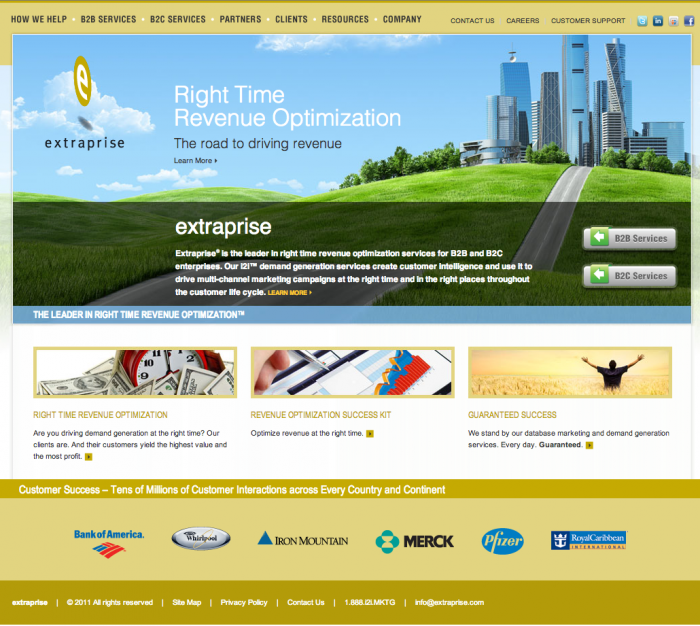 Extraprise, the leader in right time revenue optimization services for B2B and B2C enterprises and Exclusive Concepts, a leading e-commerce marketing firm, today announced a partnership that will enable B2B and B2C clients to further enrich their marketing data from every channel to drive customer intelligence-based multi-channel marketing campaigns. Leveraging Exclusive Concepts’ search engine optimization, pay-per-click, and Web site speed and conversion optimization services, Extraprise clients can compliment their outbound email marketing and mobile i2i Marketing Services. Enterprises that incorporate inbound marketing services provided by Exclusive Concepts as part of an integrated multi-channel marketing effort acquire strategic insights and improved ROI. For instance, prospects that are targeted through outbound marketing campaigns can be engaged as they browse online periodicals, participate in social networks, and conduct follow-up web searches. They can then be led to websites that are optimized to load quickly, and lead them through the conversion funnel faster. Along the way, data is collected that informs all marketing and sales efforts in real-time, thereby conferring strategic benefits important to B2B and B2C enterprises. Exclusive Concepts, Inc., founded in 1997 with headquarters in Burlington, MA, is the leading provider of e-commerce marketing services to mid-sized online retailers. The company’s suite of services includes PPC Campaign Management, Advanced Search Engine Optimization, Scientific Conversion Testing, and Site Speed Optimization. For more information visit https://www.exclusiveconcepts.com , call 888.540.7698, or follow us on Twitter @exclusivetweet. Extraprise is the leader in right time revenue optimization services for B2B and B2C enterprises, offering the only suite of demand generation services that combines customer intelligence with multi-channel marketing campaigns at the right time in the customer life cycle. Spanning a comprehensive suite of services from lead generation to nurturing/brand loyalty to closed sale, and up-sell and cross-sell, Extraprise’s i2i demand generation services are suitable for clients at all levels of marketing maturity. Delivered through its Guaranteed Success Program as a hosted or on premise service, Extraprise continually meets the evolving marketing needs of its customers by driving tens of millions of customer interactions resulting in hundreds of thousands of buying opportunities from every country and continent. For more information, visit www.extraprise.com or call +1(888) i2iMKTG. Extraprise is a registered trademark of Extraprise Group Inc. All other trademarks are the property of their respective owners. Copyright © 2012 Extraprise Group Inc. All rights reserved.